To reclaim clay you'll need two of the most valuable commodities a potter has (or hasn't in my case) - time and space! It's not the most glamourous part of the pottery process, but unless you want to disappear under an ever increasing mountain of clay scraps and slurry, reclaiming clay is a necessary evil. This weekend I plan on preparing to reclaim. I don't have a pugmill (yet), so have to reclaim manually. To do this I have to make sure the clay is fully dried out. During winter this is not as easy as it might seem. Up until recently I've been drying my pottery in the house as the studio is always too cold. However, I've now installed a wood burning stove in there and so hopefully this'll speed up the drying process. Once I've got a bucket of dry clay I can then smash it up with a hammer into smallish (gravel sized) pieces. I'll then pour the dry contents into a bucket with an old cloth lining it. (The cloth helps when lifting the wet clay from the bucket. I have seen a wire wastepaper basket used as a bucket liner to lift the clay out.). Next I fill the bucket with water and a drop of vinegar. The vinegar helps to break down the clay quicker. 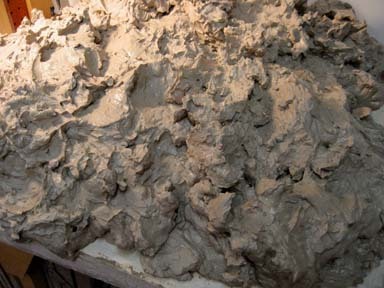 After a few days I'll drain off some of the excess water leaving behind clay that's a thick buttery consistency. This mixture is then spread evenly over a plaster bat. (I make my plaster bats by pouring plaster mix into large thick foil turkey trays). As the clay drys out I'll turn it so that it drys evenly. once it becomes stiff enough I'll knead it and then store it in plastic bags. i'm hoping to get a pugmill this year to speed up this process, but of course this involves those other commodities that are alsways in short supply, - space and money!